Round washer, 2 1/2" diameter x 8 guage (0.1644") thick with 1 1/16" diameter hole for 1" diameter bolt. Manufactured in complaince with ANSI B18.22.1. Galvanized per ASTM A-153 or ASTM B695. Round flat cast washer, 4" diameter x 1/2" thick at boss, with 1 1/16" diameter hole for 1" diameter bolt. Manufactured in compliance with NEMA PH-10. Cast ductile iron material per ASTM A536. Galvanized per ASTM A-153. Round washer, 1 3/8" diameter x 12 guage (0.1046") thick with 9/16" diameter hole for 1/2" diameter bolt. Manufactured in complaince with ANSI B18.22.1. Galvanized per ASTM A-153. WASHER, ROUND, 11/16in HOLE, 1 3/4in DIA; Packaged 100 per box and 1000 per master carton. Round washer, 2" diameter x 9 guage (0.1495") thick with 13/16" diameter hole for 3/4" diameter bolt. Manufactured in complaince with ANSI B18.22.1. Galvanized per ASTM A-153 or ASTM B695. WASHER, ROUND, 13/16 in HOLE, 2in; Packaged 100 per box and 1,000 per master carton. Round flat cast washer, 3" diameter x 7/16" thick at boss, with 13/16" diameter hole for 3/4" diameter bolt. Manufactured in compliance with NEMA PH-10. Cast ductile iron material per ASTM A536. Galvanized per ASTM A-153. Round washer, 2 1/4" diameter x 8 guage (0.1644") thick with 15/16" diameter hole for 7/8" diameter bolt. Manufactured in complaince with ANSI B18.22.1. Galvanized per ASTM A-153 or ASTM B695. Round flat cast washer, 4" diameter x 1/2" thick at boss, with 15/16" diameter hole for 7/8" diameter bolt. Manufactured in compliance with NEMA PH-10. Cast ductile iron material per ASTM A536. Galvanized per ASTM A-153. WASHER, ROUND, 7/16in HOLE, 1in DIA; Packaged 100 per box and 1000 per master carton. Round washer, 1" diameter x 14 guage (0.0747") thick with 7/16" diameter hole for 3/8" diameter bolt. Manufactured in complaince with ANSI B18.22.1. Galvanized per ASTM A-153 or ASTM B695. 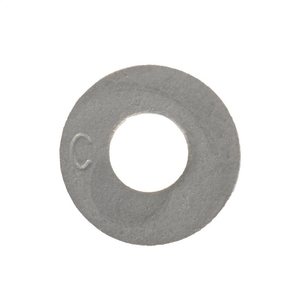 Round washer, 1 1/4" diameter x 14 guage (0.0747") thick with 9/16" diameter hole for 1/2" diameter bolt. Manufactured in complaince with ANSI B18.22.1. Galvanized per ASTM A-153 or ASTM B695. WASHER, ROUND, 9/16in HOLE, 1 3/8in DIA; Packaged 100 per box, and 1,000 per master carton. Round washer, 1 3/8" diameter x 12 guage (0.1046") thick with 9/16" diameter hole for 1/2" diameter bolt. Manufactured in complaince with ANSI B18.22.1. Galvanized per ASTM A-153 or ASTM B695.